As a parent, you will able to customize the notifications you receive to the email address used to register your parent account. The notifications will be the same your student is receiving. DO NOT update your student email address to the email address used to register your parent account. 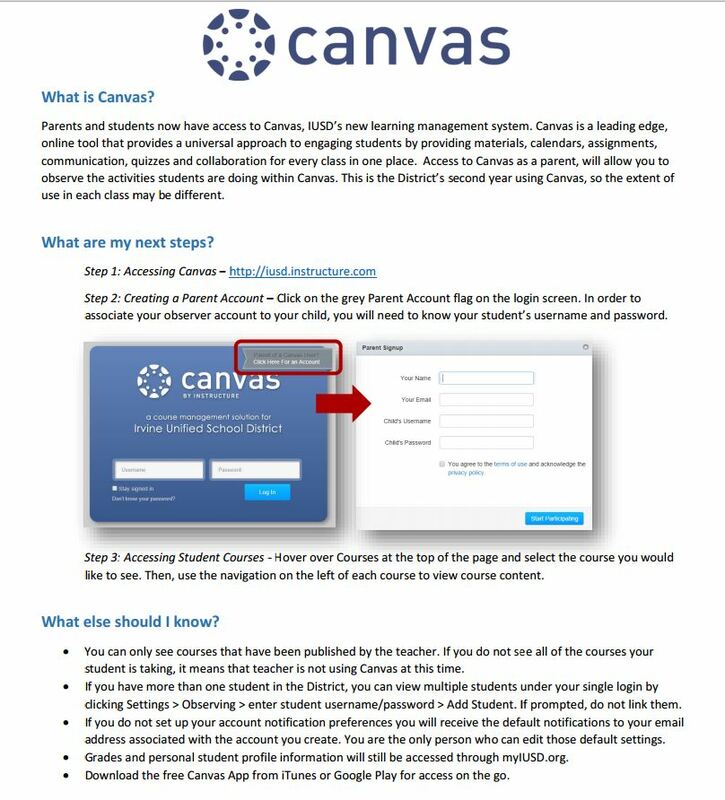 Canvas will recognize the email addresses as the same and will ask to link the accounts. This will merge the accounts with the same email address into one account. Merging accounts can cause serious issues for student’s and can prevent them from accessing some course materials. Irvine Unified School District is excited to support our student’s success by providing all enrolled students with five full copies of Office 365 ProPlus at no cost. Students are able to download this software for home use on a PC, Mac or mobile device thanks to our partnership with Microsoft. While IUSD does not currently provide students with email accounts, an email address is required for Microsoft logins. Your student’s IUSD username followed by @iusd.org will form the email address you should use to log in. The default password is your student’s 9-digit Permanent ID Number. However, you student may have changed this password if they regularly log in to IUSD computers at school. Ask them what they are currently using. During the installation process, you may be asked for an email address and password. Continue to use the same information as before. Adobe Spark for Education is a tool that allows students and teachers to create and share quick and easy linear multimedia presentations. Often times our teachers find amazing new software in the realm of educational technology. These programs were available for you to choose to accept or deny during your re-registration process on aeries. Here is a current and updated list.